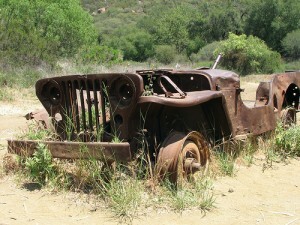 FAQ: Is My Jeep Eligible for the Cash for Clunkers Program? Thinking about leveraging the government’s rebate program to get yourself a new ride? Here are a few important facts that you need to know. Your turn-in vehicle must have been registered and insured to you for the full year prior to your trade-in. So, for those budding entrepreneurs out there, you can’t pick up a POS ride for $100 in the morning and limp it into the dealership in the afternoon for a $3,500 rebate. Likewise, you can’t park your trailer load of crappy cars outside of the dealership and sell them for $2,000 to incoming car buyers who don’t have a turn-in that’ll fetch them $3,500 – $4,500. The rebate program only applies to new vehicle purchases. So, now that you know the basic requirements. Let’s talk about whether this even makes any sense for a current Jeep owner. If you’re looking to trade up to a new Jeep (anything besides a Patriot or Compass), you’re out of luck b/c of the mileage requirements. Your Jeep turn-in would meet the mileage requirement, but the new purchase (Wrangler for example) would get less than 18 MPG…so, no soup for you! Ok, let’s talk a little crazy for a bit and assume that you’re sick of your Jeep (gasp) and want to trade it for something with better fuel efficiency, inferior off-road capabilities, and a much lower fun factor. Does the cash for clunkers program make sense now? The answer is, maybe. I say, maybe b/c you really need to evaluate the current book value of your Jeep and see if a turn-in would actually make financial sense for you. For example, my 1998 Wrangler w/ 120,000 miles on it still has a book value of roughly $5,000. $5,000 is higher than the govt rebate, so I’d actually lose money if I did this deal….not to mention that my Jeep has lockers, new gears, and a bunch of other goodies that aren’t reflected in a book value from Kelley Blue Book or NADA, for example. Have you had positive or negative experiences with the new cash for clunkers program?…please share in the comments. My 1993 Jeep Cherokee was definitely in its last stages of affordable repairs. Just as I (and my mechanic), decided it was best to look for a new car, the clunkers came out. I was going to have to go toward a Dodge Caliber or a Jeep Compass in order to meet my budget. Alas, there was not one to be found in a 400 mile radius. Just as the last clunkers day was announced, I hit my Chrysler/Jeep dealership and enquired about the possibly of ordering a car. Nope. I did know, that the one car I would love to afford was the Liberty, but at 23+k, it wasn’t in the budget. I asked about the Liberty anyway and right off the bat, I got a price almost 4k less than their internet price (I had spent much time researching). That got me to sit down. Then, right off the bat I was offered 1,200 for my Jeep (I was thinking it might be worth $400) and learned that Jeep had a 3k rebate. Thus, I got 4,200 right there. I worked with them on the price some more and got me my dream Jeep. I didn’t even need the clunkers thing to get me my Jeep. How great is that? @JE: congrats on the new ride. Sounds like you did some good negotiating. 🙂 Hope you enjoy your Liberty. Next post: FAQ: Should I Lift My Jeep?